Dainese, one of the best motorcycle safety gear manufacturers, is tackling the final frontier with two new suits designed in partnership with NASA and ESA (European Space Agency) to help keep astronauts safer in space. with various hospitals to study how the body moves and works. More specifically, Dainese has beem focusing on the different lines that run through the body to control how it moves. NASA tapped Dainese and, using the company’s input and data and through collaboration with MIT, worked on what would become the Biosuit you see pictured above. The Biosuit, which was funded by the NASA Institute for Advanced Concpets, is basically the world’s fanciest compression suit, and it all those little lines on it are actually filaments that “represent the lines of so-called non-extension.” Those are the lines of the body that neither stretch nor contract during the body’s movements. The lines on the suit can be mechanically pressurized to compress against the body, but do so without restricting mobility. The current plan is to use the suit for the human mission to Mars, which NASA would like to reach by 2030. ESA was impressed with the Biosuit, but they had a slightly different need they wanted to tackle. Astronauts were coming home from space and needing to spend several days in a wheelchair because of herniating discs due to the elongation of the spine that occurs without the effects of gravity on the body. (Ouch, right?) They gave Dainese their data and helped facilitate further collection from more time spent in space, and they asked Dainese to come up with a fix. 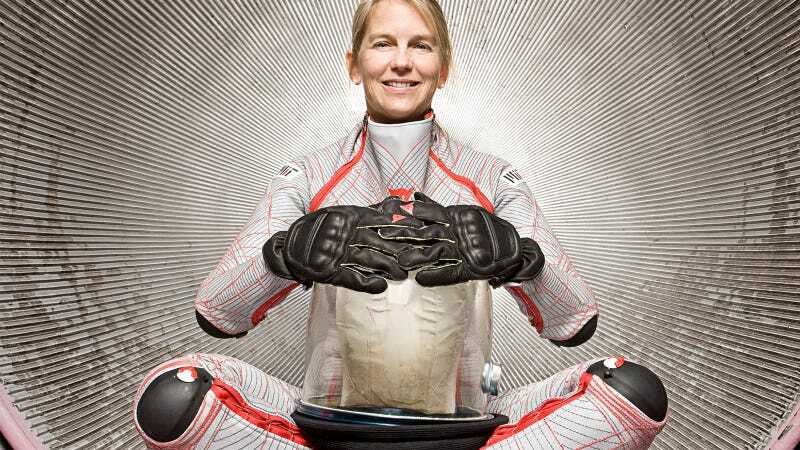 The resulting Skinsuit, while not as fancy -looking as the Biosuit, is actually a super cool piece of tech. The bulk of the suit is made from a four-way elastic stretch material, while the upper section is rigid. The suit compresses from shoulders to feet to re-create the effects of gravity on the body. The vertical gray lines are nylon belts that run the length of the suit, while the white horizontal lines are what’s used to constrict the suit. The positions of those lines are custom to the owner of the suit, and are determined based on studies from the ESA on the optimal placement. Dainese has a long history of getting new safety products to market first. The company’s first product was a pair of motocross pants in 1972, and it was the first to release a back protector (1978), knee sliders for leathers (1980), the aerodynamic hump on leathers (1988), toe sliders (1993), carbon fiber/kevlar gloves (1995), and the D-Air airbag technology (2000). Michele Brasca, the suit’s designer, told me that Dainese is already at work on their next project with NASA and ESA, but wasn’t quite ready to fill me in on the details. He did, however, tell me that they were looking at using some of the new fabrics and compression technology in some of their upcoming touring motorcycle riding gear. Motorcycle gear in space! It’s happening.